As part of the agreement, Des Moines city officials will be required to have all buildings and residents physically packed onto trucks and relocated to a halfway respectable city by no later than 2028. The city’s new destination must be located outside of Iowa’s borders, have access to dial-up internet or better and have a restaurant not named Applebee’s as its most desirable dining establishment. 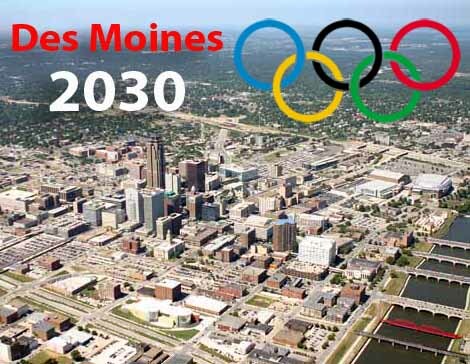 Standing beside IOC officials at Tuesday’s press conference, Des Moines mayor Frank Cownie proudly brandished a t-shirt with “Des Moines 2030” written crookedly on the front in blue Sharpie. While the 2030 Olympics will be the first games to ever be hosted in a city not actually located within its actual city limits, Des Moines boosters have been drawing up relocation plans for just such an occurrence for over two decades. Since 1984, city officials have contemplated moving the Iowa State Fair to another state, only to have neighboring states refuse admittance. Despite stipulating the unprecedented forced move, the IOC has declined to financially subsidize the city’s relocation efforts. They have, however, agreed to supply Des Moines officials with nearly three dozen flattened cardboard boxes they picked up behind a local grocery store. The remainder of the relocation costs—nearly $3.2 trillion—will reportedly be covered by a 4% tax increase on all Walmart purchases in the city. Local residents could hardly contain their excitement following Tuesday’s announcement. Des Moines police were forced to close down several city streets over lunch as nearly two dozen revelers marched in celebration.